(CNN) -- The family of a man slain by a former transit police officer filed a $50 million lawsuit Monday against officers involved in the New Year's Day shooting, the family's attorney told CNN affiliate KTVU. 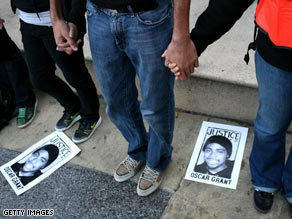 The shooting of Oscar Grant III, an unarmed man, sparked large protests in Oakland. The hefty price tag is double what the family's attorney originally asked for in its legal claim, which is the first step in filing a lawsuit. In the weeks after the shooting, John Burris, the victim's family attorney, filed a $25 million claim alleging wrongful death. Burris said he decided to raise the amount of the lawsuit after learning more about the shooting of 22-year-old Oscar Grant III on a platform of a Bay Area Rapid Transit train station. "It is the most outrageous shooting, police-misconduct case I have ever been involved in," the veteran civil rights lawyer told the affiliate. The lawsuit alleging wrongful death and violation of civil rights names then-Officer Johannes Mehserle, the BART police chief and other officers involved in the incident, Burris said. The shooting drew national attention after grainy cell phone videos of the incident taken by a bystander began circulating on the Internet and news shows. The video showed Mehserle, 27, pulling his gun and shooting Grant in the back as another officer kneeled on Grant. Mehserle may have intended to draw and fire his Taser rather than his gun, according to a court filing by his attorney. The shooting of the unarmed man sparked large protests in Oakland and led to the arrest of Mehserle on a murder charge. All About San Francisco Bay Area Rapid Transit District • TASER International Inc.